StoreHippo provides a fine-grained control to admin to approve or reject the products added or edited by sellers. 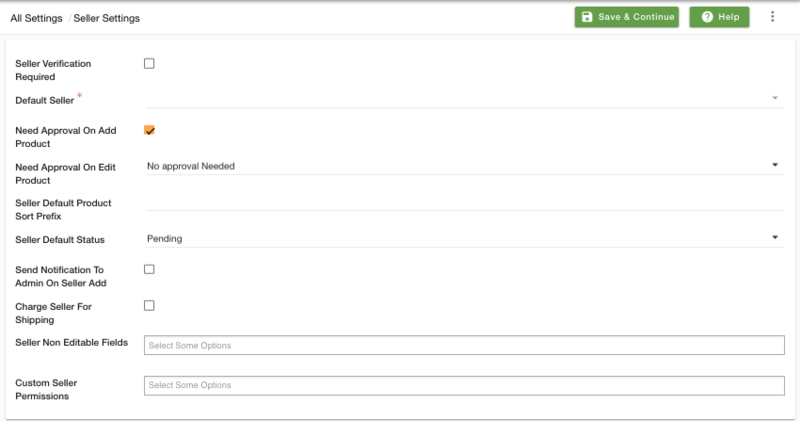 You can enable approval flow by turning on settings in Settings > Seller Settings section in StoreHippo Admin Panel. Select the check box, if you don't want seller uploaded products to be approved automatically. Seller products will be updated in pending approval list and admin will have to approve before they are published on the storefront. Select an option from the drop-down, if you want to review the seller products even when seller product information is edited. Once product information is edited by the seller, the product will automatically move to pending approval list. You can also specify particular fields or give an exception on which you want the products to go in pending approval list. You can approve/reject a product by two methods explained below. Go to the seller tab under products and change the status of Approve field to "approved"/"rejected". You can either approve a product, reject a product or you can also change the status to pending if you do not want to take any action right now. The products would be listed under different tabs based on the status you set for the products. If a product is approved and published, it would be listed under published tab. If a product is approved and unpublished, it would be listed under the unpublished tab. If a product is rejected, it would be listed under the rejected and unpublished tab. If a product is pending approval, it would be listed under pending approval and unpublished tab. You can also manage seller approval flow by changing the status of the approved field on the products page. Go to the Products page and click on the Pending Approval tab. Click on the ellipse button on the right-hand side of the product that you want to approve. Choose the Approve option from the drop-down menu. In the same way, you can reject a product by choosing the reject option from the drop-down menu under the published/unpublished tab. To approve multiple products in bulk, select the checkbox option on the top left corner of the products page as illustrated in the image given below. After you click on the checkbox button, an ellipse button will appear at the right-hand. Click on the ellipse button and choose the Approve option to bulk approve the products. The approve option will appear under Pending Approval, Rejected and Unpublished tab. Note: The option will also appear under Unpublished tab only in case of pending approval/rejected products. You can follow the same steps to bulk reject products under published/unpublished/pending approval tab.